Spinal ankylosing disorders are conditions characterized by ossification of one or more ligaments in the spine and are associated with progressive limitation of spinal movements leading to ankyloses. Spinal ankylosing conditions include ankylosing spondylitis (AS), diffuse idiopathic skeletal hyperostosis (DISH), end-stage spondylosis multiform (EASM), and ossified posterior longitudinal ligament (OPLL). Fractures are common in ankylosed spine following minor low-energy trauma because of alteration in the bone composition and biomechanical properties.,,, The ossification of the supportive ligaments and soft tissues make these fractures unstable and susceptible to displacement and neurological deficit. AS is a chronic seronegative inflammatory arthritis and is characterized by progressive ossification of spinal ligaments and ankyloses of sacroiliac, facet, costovertebral, and occipitocervical joints. Consequently, the patient develops kyphosis with a stiff spine which constitutes risk factors for spinal fractures. The lifetime risk of vertebral fracture in patients with AS is 3.5 times higher than in general population, and about 75% of the fractures occur in the cervical spine followed by the thoracic and lumbar spine.,,, It is important to do a whole spine screening since about 8%–13%, of patients can have multilevel fractures. The incidence of spinal cord injury is about 11 times higher than the general population. Other factors contributing to the neurological deficit are delayed diagnosis and displacement during transportation. The fractures generally happen in patients with an average age of 63.4 years, which is significantly older than the usual spinal cord injured patients. The treatment is challenging because of kyphosis, osteoporosis, associated with restrictive lung disease, and medical comorbidities. 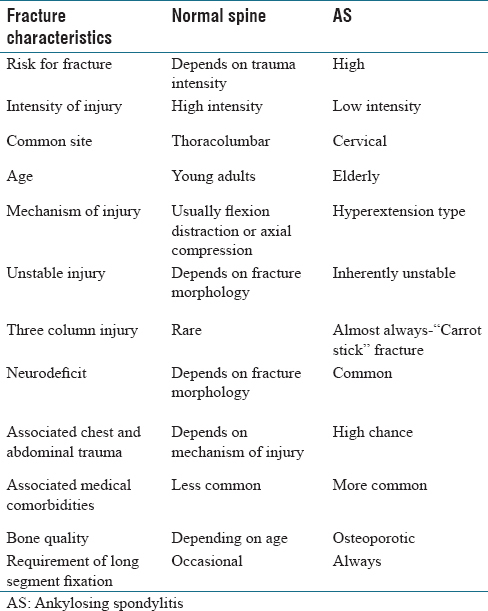 The characteristic features of AS, as opposed to other traumatic spine injuries, are listed in [Table 1]. Current research recommendations favor early surgical stabilization as this has been shown to improve survival rates., Complication rates are relatively higher with about 51% in AS patients and 32.7% in DISH patients. The overall mortality rate within 3 months is about 17.7% in AS and 20% in DISH patients. DISH is a noninflammatory disorder in which the spinal longitudinal ligaments slowly develop ossification in the segments involved, ultimately ending in rigid ankyloses. DISH is diagnosed by the presence of bridging ossification of the anterior longitudinal ligament over at least four consecutive segments. Endocrine and metabolic disorders such as diabetes, acromegaly, hypervitaminosis A, hyperuricemia, and dyslipidemia have been found associated with DISH. DISH is differentiated from AS by the absence of involvement of SI, apophyseal, and craniocervical joints. EASM is an inflammatory condition associated with metabolic and endocrine disorders and includes advanced age-related degenerative spondylosis and idiopathic hypertrophic osteoarthropathies. The spine in this condition is sclerotic with dystrophic joints and limited ankyloses. Fluorosis also causes ankyloses; however, flourotic spines are not associated with fractures following trivial trauma because of sclerotic bone composition and absence of deformity. The further discussion will be on AS as it is the most common and the management principles remain same for all the ankylosing spinal conditions. The changes in the osseous structure of the vertebral bone associated with concurrent changes in the biomechanics of the spine are responsible for an increased propensity for spinal fractures in AS and also the gross unstable nature of these fractures. Inflammation at the site of insertion of muscles leads to enthesopathy followed sometimes by destruction at these sites leading to erosions of the vertebral body at these sites. These erosions are replaced by woven bone in connective tissue which develops into lamellar bone. These form syndesmophytes which eventually fuse leading to ankyloses. ossification generally involves apophyseal joints, disc end plates, anterior, and anterolateral attachments of the ligaments to the vertebra resulting in the classic bamboo appearance of the spine. The spine accommodates into kyphosis to offload the inflamed facet joints and to reduce pain., The subsequent ossification process makes this flexion posture into progressive and permanent rigid kyphosis. The changes in bone and muscle function lead to shielding of normal loading pattern of the spine. This along with kyphosis, reduced physical activity level and decreased functional capacity related to pain, stiffness, and ankyloses, leads to osteoporosis in AS patients. Altered hormones and inflammatory cytokines also contribute to osteoporosis. These syndesmophytes and ossification are responsible for the false increased BMD seen in AS and conceal the actual trabecular bone loss in patients with AS.,, DEXA can be erroneously normal in some patients due to this conceal. The total body calcium lost by men with AS over the age of 50 is 7.5 times more compared to men who don't have AS. The most common mechanism of injury is distraction-extension resulting in an unstable three-column injury with an anterior gap and can result in a significant neurological deficit. The fractures can occur through disc or vertebral body or a combination involving body and disc. The calcification of the annulus reduces the elasticity of the disc and offers the least resistance even in minor trauma. The most common mode of presentation is new onset back or neck pain following a trivial fall like falling from standing or sitting position. Some of the fractures are diagnosed incidentally while investigating for back pain. Males are more predominant and the average patient age at the time of injury has been reported as 63.4 years. Fractures are common in the cervical region because of increased mobility, smaller vertebral bodies, and the mobility of heavy skull on the cervical spine., Patients can also present with neurological deficits which have been reported to be 67.2% AS patients and 40% in DISH patients. Secondary deterioration of the neurological status of up to 14% has been reported due to secondary fracture displacement during transport or investigations in the hospital. Rarely, a patient can present with improved forward gaze and reduction of cervical deformity following a fall. One of the major factors contributing to neurological deficits is a delay in diagnosis. The causes for the delay may be due to the patient or the doctor., Patients may attribute back pain to the preexisting back pain and present late. Einsiedel et al. coined the term “The Fatal Pause” when the patients did not identify the symptoms until they started to develop neurologic symptoms. The causes for doctor delay are due to lack of awareness of the condition, absence of minor trauma and difficulty in interpreting the plain radiographs. Neurological deficits may be either due to spinal cord compression by the displaced fracture or epidural hematoma due to bleeding from the hyperemic bone. A high index of suspicion is necessary to diagnose fractures in patients with the ankylosed spine. Care be taken to prevent extension of the neck by supporting the neck on pillows and by avoiding neck collars. Identification of the fracture could be difficult in a patient with AS, and a high index of suspicion is necessary for patients who present with recent onset pain and change of posture. It is imperative that imaging is done under close supervision and care should be taken not to disturb the resting spinal contour in neurologically intact patients by using adequate cushions. Adequate care should be taken to prevent extension of the neck by supporting the neck on pillows and by avoiding neck collars. Radiographs have been the key in classifying AS and are a gold standard in assessing deformity. However, AS spinal fracture radiographs are difficult to interpret because of associated syndesmophytes, abnormal bone density, and deformity. Junctional areas like cervicothoracic spine are very poorly visualized because of associated kyphosis adding difficulty in interpretation [Figure 2]., The fractures in AS are seen as a break in the continuity of bone sometimes associated with a sharp or subtle change in spinal contour at the fracture site. They can also be associated with osteolysis. The advantages of easy availability and cost-effectiveness of radiographs are offset by significant disadvantages as more than 50% of fractures, particularly in the cervical spine are missed on radiographs. A study by Milicić et al. reported delayed diagnosis in about 42% of spinal fractures in AS, of which 17% had neurologic deterioration. In addition, the risk of positioning for antero-posterior and lateral radiographs and the longer time taken can have detrimental consequences on the stability and neurological consequences of the fracture. The high-resolution multidetector computed tomography (MDCT) is a reliable imaging modality for identifying thin fracture lines and associated structural damages and erosions. It is also useful in showing the extent of defects and gaps in the fracture if any and the status of adjacent bones. Koivikko and Koskinen have revealed the superiority of MDCT to plain radiographs or magnetic resonance imaging (MRI) in showing more injuries and detailed information on fracture morphology. They reported a diagnostic efficiency of only about 48% in radiographs and 60% in MRI. MRI is valuable in the evaluation of the soft tissue and injury to the spinal cord. MRI also allows specifically to look for epidural hematomas which are commonly associated with AS fractures. Other advantages of MRI include identifying nonunions, Andersson lesion, and screening of the whole of spine and to differentiate from infections [Figure 3]. de Roos et al. suggested that absence of soft-tissue swelling, paravertebral mass, or loss of fat planes on MRI can differentiate injury from infection. The whole spine MRI and CT are complementary investigations for patients with AS so as not to miss noncontiguous fractures, marrow edema, disc injury, PLL injury, and epidural hematomas. Conservative methods, including immobilization by a Halo vest and prolonged bed-rest in traction or a collar, have been associated with a high rate of complications. With advances in care and surgical technique, there is a rising trend towards surgical management, and conservative treatment is reserved for medically unfit patients. Conservative care includes halo vest or cervical collar for cervical fractures., The kyphotic deformity and the abnormal body morphology necessitates the use of customized braces to maintain the natural preinjury contour. Patients should be regularly followed up and observed for any displacement of the fracture. Normal braces should be used with caution and may cause hyperextension at the fracture site and neurological worsening and should be reserved for fractures with a minimal deformity in patients with normal spinal contour. The unstable nature of these fractures often does not allow efficacious brace treatment leading to loss of correction and conversion to operative intervention. The current treatment recommendations favor surgical management of fractures in AS. Recent studies have shown better survival and reduced morbidity with surgical stabilization. Of the surgical options available the current literature favors posterior,, and combined anteroposterior approach, over stand-alone anterior approach. In AS, the chin on chest deformity makes anterior exposure difficult. In addition, long segment fixations required in AS and complications of thoracotomy which can complicate pulmonary status of an already fused thoracic cage refrains the surgeon from using anterior standalone approach. Fractures in an ankylosed spine are analogous to that of long bone diaphyseal fractures, the principles of which mandate multilevel fixation. Although most of the patients can be operated electively, patients with incomplete neurological deficit and secondary neurological insult should be operated on emergently. Significant fracture malalignment requires a low-weight skull traction not exceeding 5–10 lb. The traction direction is chosen to take the preinjury cervico-thoracic alignment into consideration as hyperextension should be avoided to prevent neurological deterioration. Due to the highly unstable nature of these injuries, patients are at risk for neurological worsening when being intubated. The risks associated with positioning can be minimized by awake fiber-optic intubation and electrodiagnostic monitoring pre- and post-positioning. Measures should be taken to avoid hyperextension by rigid fixation of the skull with Mayfield clamps or a comparable device. Even though numerous classifications,, have been developed concerning spinal fractures related to AS, none of them had any impact on optimizing treatment plans. Anterior access is less traumatic (hence more suitable for patients with poor constitutions), minimizes the risks of displacement during positioning, provide immediate stability and a greater surface area for bony fusion and has less incidence of postoperative infections. However, the biomechanical stability of anterior approach is questionable. The osteoporosis frequently seen in these patients preferentially affects the anterior column. Failure rates of initial anterior fixation as high as 50% have been reported. A long lever arm neutralization of lower cervical fractures requires long anterior plates extending into the upper thoracic region, which then needs access extension into the upper mediastinum. Furthermore, anterior fixation can be particularly difficult in those patients with associated chin-on-chest deformity. The posterior-alone approach can restore the alignment of the spine, stabilize the injured segments, and allow broad decompression of neurological elements. Multisegmental posterior fixation with autologous cancellous bone graft offers a biomechanical advantage over anterior fixation and has resulted in decreased morbidity compared with combined anterior-posterior fixation. However, the extensive dissection of cervical muscles required, increased risk of wound infection, and inability to access anterior spinal cord compression are its disadvantages. It is unsuitable for cases with anterior fracture gaps. In addition, a fusion of the posterior elements may make localization of the anatomic landmarks difficult which can lead to pedicle fracture, neurodeficit, and vertebral artery injury. The anteroposterior or the circumferential approach is the current treatment of choice in cases with marked three-column instability. It is used in approximately 25% of patients with AS and cervical spine fractures. The primary indication of adding an anterior approach to posterior surgery is the presence of a persistent deformity, gap or displacement that is compromising the spinal cord following posterior instrumented reduction. The high morbidity associated with the procedure in the form of long surgical duration, blood loss, and great trauma makes it less preferable for patients with poor constitutions. In our hospital, we prefer anterior-alone approach for fractures with no or minimal displacement [Figure 5]. Multilevel fractures or those with significant cord compression due to associated OPLL or epidural hematoma in the absence of marked kyphosis or collapse are managed by posterior alone approach [Figure 6]. We recommend a combined approach for unstable fractures (translation, distraction, or angulation) and fractures with anterior gap [Figure 7]. Irrespective of the approach used it is important to augment screw purchase by increasing number of fixation points, using larger diameter screws, trying for bicortical purchase, and convergent screws. 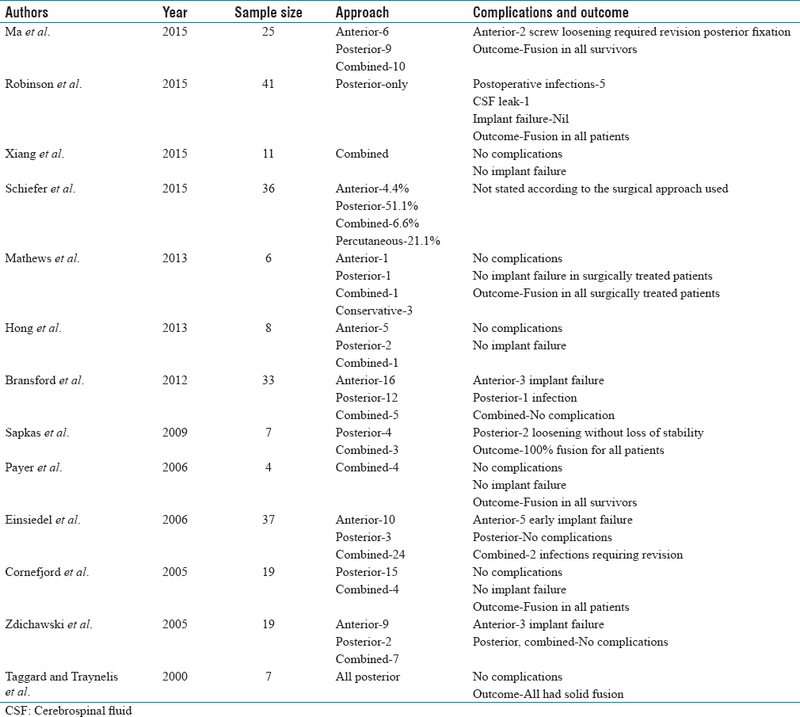 Authors have used variable approaches, and [Table 2] enlists the approaches employed and their associated complications. Decompression in the absence of neurological deficit has the disadvantage of causing adhesions between the dura and posterior structures resulting in the postlaminectomy membrane, causing instability sometimes, and also decreasing the fusion area. It also makes revision surgery if required more complicated. The disadvantages of decompression in the absence of neurological deficit far outweigh the theoretical advantage of preventing neurological deficit should an epidural hematoma occur. However, when in doubt it is advisable to add a decompression to posterior instrumented fusion. Although the majority of the published studies prefer restoration of former kyphosis, some have suggested using the fracture as an opportunity to correct the kyphotic deformity. This can be attempted, especially in patients who presented with a disabling preinjury cervicothoracic kyphosis and absent horizontal gaze but had no neurological problems. All patients are given a Philadelphia cervical collar for at least for 3 months postoperatively. Plain radiographs are taken at 3 months, 6 months, and 1 year postoperatively. Thoracolumbar fractures occur more frequently in AS patients as compared to the general population. The principles of fixation for thoracolumbar fractures in AS are the same as cervical spine fractures due to the long lever arms requiring multilevel fixation posteriorly. In view of the unstable nature of these fractures associated with long lever arms, compromised bone quality and fused spine most authors have suggested fixation at least three levels above and below fractured vertebra.,,,, Intraoperative traction is rarely required. Positioning is of vital importance in these predominantly extension type of injuries. It should be done over well-padded parallel bolsters on a table which has multiple options of flexion and extension to reduce and close the fracture gap, to help achieve preinjury alignment or to help in controlled correction. Jackson table or other similar lordosing tables should be avoided. Multiple studies have shown the superiority of operative treatment in improving neurological deficits, giving better pain relief and fusion as compared to nonoperative treatment. Isolated anterior procedures are not favored as they are associated with higher failure rates. Posterior or combined posterior anterior approaches are typically recommended.,, The most commonly used approach in the management of thoracolumbar fractures in AS patients is the posterior approach. The posterior approach has the advantage of ease, familiarity, allowing multiple points of fixation for conferring stability, creating the preinjury spinal profile and if required deformity correction., It has the advantage to decompress the spinal canal if required and also in the presence of significant gap allows anterior column reconstruction from behind obviating the need for another anterior surgical approach. Anterior reconstruction with a structural graft or cage may be considered in the presence of a large anterior gap in the same stage or as staged procedure [Figure 8]. Certain authors have advocated the use of minimally invasive options such as percutaneous posterior fixation and described good functional outcomes with low complications associated with surgery. In experienced hands, these injuries provide an opportunity for deformity correction. The risk of an added procedure should be weighed against the need to avoid another surgery in the future vis a vis complications. When deformity correction is indicated, posterior shortening procedures are preferable, for example, pedicle subtraction osteotomy, compared to anterior column lengthening procedures which can injure vascular/visceral structures and also the spinal cord. The aim of surgical reconstruction is to provide stability to aid fusion and address any compressive lesions by decompression rather than deformity correction. Challenges in surgery are due to excessive bleeding encountered due to the inflammatory nature of these disorders, and the obliteration of the anatomic landmarks. The risk of infection is higher due to the extensive exposure during surgery and increased blood loss during these procedures. Compared to the healthy general population, the morbidity of spine fracture in AS is 3.5 times higher., Complications are also expected as most of them are elderly patients with multiple comorbidities. About 65% of them sustain neurological deficits and up to 15% of patients have a secondary deterioration of neurologic status mostly due to delay in diagnosis.,, A meta-analysis of 345 published cases between 1980 and 2007 finds 3-month mortality of 18%. The most frequent cause of death both in the acute phase and at later follow-up is respiratory complication such as pneumonia. Associated visceral injuries and rare intrathoracic complications including tracheal rupture and aortic laceration or dissection in thoracolumbar injuries have been cited in the literature. Treatment related complication rates remain higher in both surgical and nonsurgical techniques. Loss of reduction, nonunion and neurological deterioration have been reported after nonoperative treatment, which often leads to secondary surgery. With regard to the surgical treatment, wound infections up to 16%, pulmonary complications up to 63%, and mechanical complications up to 23% are described. Therefore, an appropriate standardized workup and consideration of specific injury patterns are essential before decision-making. Fractures are a serious complication of AS and patients are more prone to develop neurological deficits. Most often, the underlying mechanism of injury is a small-magnitude force. Plain radiographs alone may be insufficient in these patients because of osteoporosis, ossification of ligamentous structures and disc spaces, and complicated osseous deformities. Furthermore, concomitant spinal fractures are more common due to the long lever-arm biomechanics in these patients. This makes multiple imaging modalities often necessary. Nonsurgical treatment (Halo-vest, Cervical collar, TLSO etc.) has largely been replaced by surgical treatment in view of the significant risk for secondary loss of reduction and neurological aggravation along with pulmonary and decubitus complications. Surgical approach can be anterior, posterior (most commonly performed), or combined depending upon the location and pattern of injury. However, surgical management does not change the inherent complication rates and mortality risks which are largely dependent on the initial injury severity and comorbid conditions. Patient and physician education in creating better awareness regarding the do's and don'ts as well as an optimized biological treatment can considerably bring down the complication rates to a minimum. Braun J, Sieper J. Ankylosing spondylitis. Lancet 2007;369:1379-90. Hunter T, Forster B, Dvorak M. Ankylosed spines are prone to fracture. Can Fam Physician 1995;41:1213-6. Prieto-Alhambra D, Muñoz-Ortego J, De Vries F, Vosse D, Arden NK, Bowness P, et al. Ankylosing spondylitis confers substantially increased risk of clinical spine fractures: A nationwide case-control study. Osteoporos Int 2015;26:85-91. Robinson Y, Sandén B, Olerud C. Increased occurrence of spinal fractures related to ankylosing spondylitis: A prospective 22-year cohort study in 17,764 patients from a national registry in Sweden. Patient Saf Surg 2013;7:2. Jacobs WB, Fehlings MG. Ankylosing spondylitis and spinal cord injury: Origin, incidence, management, and avoidance. Neurosurg Focus 2008;24:E12. Finkelstein JA, Chapman JR, Mirza S. Occult vertebral fractures in ankylosing spondylitis. Spinal Cord 1999;37:444-7. Vosse D, Feldtkeller E, Erlendsson J, Geusens P, van der Linden S. Clinical vertebral fractures in patients with ankylosing spondylitis. J Rheumatol 2004;31:1981-5. Shen FH, Samartzis D. Cervical spine fracture in the ankylosing spondylitis patient. J Am Coll Surg 2005;200:632-3. Olerud C, Frost A, Bring J. Spinal fractures in patients with ankylosing spondylitis. Eur Spine J 1996;5:51-5. Altenbernd J, Bitu S, Lemburg S, Peters S, Seybold D, Meindl R, et al. Vertebral fractures in patients with ankylosing spondylitis: A retrospective analysis of 66 patients. Rofo 2009;181:45-53. Lukasiewicz AM, Bohl DD, Varthi AG, Basques BA, Webb ML, Samuel AM, et al. Spinal fracture in patients with ankylosing spondylitis: Cohort definition, distribution of injuries, and hospital outcomes. Spine (Phila Pa 1976) 2016;41:191-6. Chaudhary SB, Hullinger H, Vives MJ. Management of acute spinal fractures in ankylosing spondylitis. ISRN Rheumatol 2011;2011:150484. Whang PG, Goldberg G, Lawrence JP, Hong J, Harrop JS, Anderson DG, et al. The management of spinal injuries in patients with ankylosing spondylitis or diffuse idiopathic skeletal hyperostosis: A comparison of treatment methods and clinical outcomes. J Spinal Disord Tech 2009;22:77-85. Rustagi T, Drazin D, Oner C, York J, Schroeder GD, Vaccaro AR, et al. Fractures in spinal ankylosing disorders: A narrative review of disease and injury types, treatment techniques, and outcomes. J Orthop Trauma 2017;31 Suppl 4:S57-74. Robinson Y, Willander J, Olerud C. Surgical stabilization improves survival of spinal fractures related to ankylosing spondylitis. Spine (Phila Pa 1976) 2015;40:1697-702. Caron T, Bransford R, Nguyen Q, Agel J, Chapman J, Bellabarba C, et al. Spine fractures in patients with ankylosing spinal disorders. Spine (Phila Pa 1976) 2010;35:E458-64. Westerveld LA, Verlaan JJ, Oner FC. Spinal fractures in patients with ankylosing spinal disorders: A systematic review of the literature on treatment, neurological status and complications. Eur Spine J 2009;18:145-56. Vosse D, Landewé R, van der Heijde D, van der Linden S, van Staa TP, Geusens P, et al. Ankylosing spondylitis and the risk of fracture: Results from a large primary care-based nested case-control study. Ann Rheum Dis 2009;68:1839-42. Ball J. Enthesopathy of rheumatoid and ankylosing spondylitis. Ann Rheum Dis 1971;30:213-23. Simkin PA, Downey DJ, Kilcoyne RF. Apophyseal arthritis limits lumbar motion in patients with ankylosing spondylitis. Arthritis Rheum 1988;31:798-802. Will R, Palmer R, Bhalla AK, Ring F, Calin A. Osteoporosis in early ankylosing spondylitis: A primary pathological event? Lancet 1989;2:1483-5. Bronson WD, Walker SE, Hillman LS, Keisler D, Hoyt T, Allen SH, et al. Bone mineral density and biochemical markers of bone metabolism in ankylosing spondylitis. J Rheumatol 1998;25:929-35. Reid DM, Nicoll JJ, Kennedy NS, Smith MA, Tothill P, Nuki G, et al. Bone mass in ankylosing spondylitis. J Rheumatol 1986;13:932-5. Devogelaer JP, Maldague B, Malghem J, Nagant de Deuxchaisnes C. Appendicular and vertebral bone mass in ankylosing spondylitis. A comparison of plain radiographs with single- and dual-photon absorptiometry and with quantitative computed tomography. Arthritis Rheum 1992;35:1062-7. Broom MJ, Raycroft JF. Complications of fractures of the cervical spine in ankylosing spondylitis. Spine (Phila Pa 1976) 1988;13:763-6. Hunter T, Dubo HI. 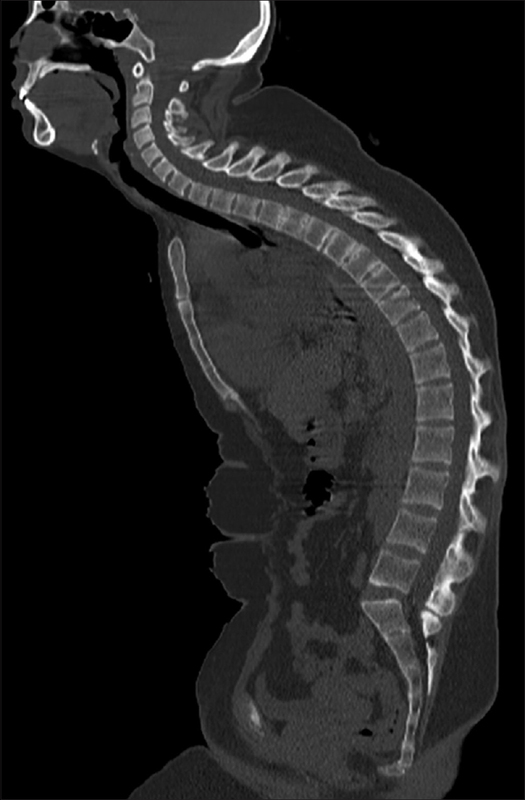 Spinal fractures complicating ankylosing spondylitis. A long-term followup study. Arthritis Rheum 1983;26:751-9. Taggard DA, Traynelis VC. Management of cervical spinal fractures in ankylosing spondylitis with posterior fixation. Spine (Phila Pa 1976) 2000;25:2035-9. Lange U, Pape HC, Bastian L, Krettek C. Operative management of cervical spine injuries in patients with bechterew's disease. Unfallchirurg 2005;108:63-8. Surin VV. Fractures of the cervical spine in patients with ankylosing spondylitis. Acta Orthop Scand 1980;51:79-84. Winkelstein BA, Myers BS. The biomechanics of cervical spine injury and implications for injury prevention. Med Sci Sports Exerc 1997;29:S246-55. Secin FP, Poggi EJ, Luzuriaga F, Laffaye HA. Disabling injuries of the cervical spine in argentine rugby over the last 20 years. Br J Sports Med 1999;33:33-6. Hendrix RW, Melany M, Miller F, Rogers LF. Fracture of the spine in patients with ankylosis due to diffuse skeletal hyperostosis: Clinical and imaging findings. AJR Am J Roentgenol 1994;162:899-904. Westerveld LA, van Bemmel JC, Dhert WJ, Oner FC, Verlaan JJ. Clinical outcome after traumatic spinal fractures in patients with ankylosing spinal disorders compared with control patients. Spine J 2014;14:729-40. Einsiedel T, Kleimann M, Nothofer W, Neugebauer R. Special considerations in therapy of injuries of the cervical spine in ankylosing spondylitis (Bechterew disease). Unfallchirurg 2001;104:1129-33. Alaranta H, Luoto S, Konttinen YT. Traumatic spinal cord injury as a complication to ankylosing spondylitis. An extended report. Clin Exp Rheumatol 2002;20:66-8. Koivikko MP, Koskinen SK. MRI of cervical spine injuries complicating ankylosing spondylitis. Skeletal Radiol 2008;37:813-9. Milicić A, Jovanović A, Milankov M, Savić D, Stanković M. Fractures of the spine in patients with ankylosing spondylitis. Med Pregl 1995;48:429-31.
de Roos A, van Persijn van Meerten EL, Bloem JL, Bluemm RG. MRI of tuberculous spondylitis. AJR Am J Roentgenol 1986;147:79-82. Samartzis D, Anderson DG, Shen FH. 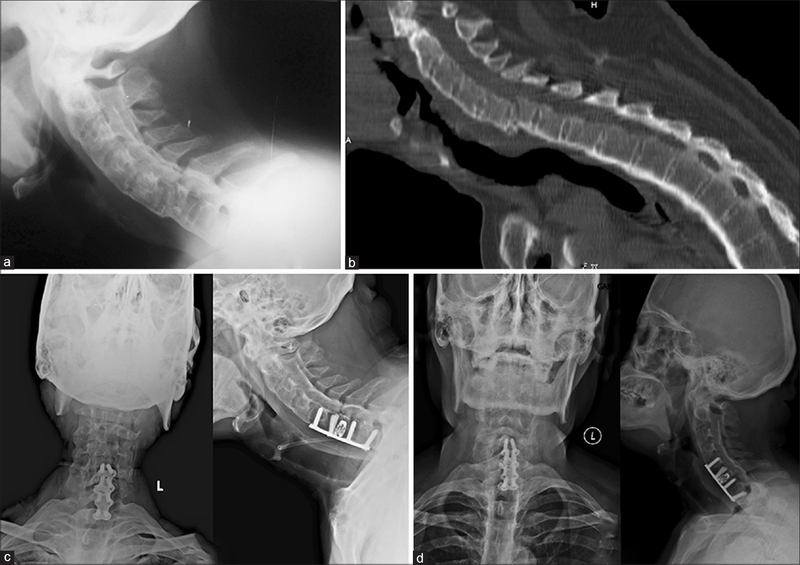 Multiple and simultaneous spine fractures in ankylosing spondylitis: Case report. Spine (Phila Pa 1976) 2005;30:E711-5. Olerud C, Andersson S, Svensson B, Bring J. Cervical spine fractures in the elderly: Factors influencing survival in 65 cases. Acta Orthop Scand 1999;70:509-13. Myllykangas-Luosujärvi R, Aho K, Lehtinen K, Kautiainen H, Hakala M. Increased incidence of alcohol-related deaths from accidents and violence in subjects with ankylosing spondylitis. Br J Rheumatol 1998;37:688-90. Paley D, Schwartz M, Cooper P, Harris WR, Levine AM. Fractures of the spine in diffuse idiopathic skeletal hyperostosis. Clin Orthop Relat Res 1991;267:22-32. Woodruff FP, Dewing SB. Fracture of the cervical spine in patients with ankylosing spondylitis. Radiology 1963;80:17-21. Sangala JR, Dakwar E, Uribe J, Vale F. Nonsurgical management of ankylosing spondylitis. Neurosurg Focus 2008;24:E5. Weiss RJ, Wick MC, Ackermann PW, Montgomery SM. Increased fracture risk in patients with rheumatic disorders and other inflammatory diseases – A case-control study with 53,108 patients with fracture. J Rheumatol 2010;37:2247-50. Carnell J, Fahimi J, Wills CP. Cervical spine fracture in ankylosing spondylitis. West J Emerg Med 2009;10:267.
de Peretti F, Sane JC, Dran G, Razafindratsiva C, Argenson C. Ankylosed spine fractures with spondylitis or diffuse idiopathic skeletal hyperostosis: Diagnosis and complications. Rev Chir Orthop Reparatrice Appar Mot 2004;90:456-65. Metz-Stavenhagen P, Krebs S, Meier O. Cervical fractures in ankylosing spondylitis. Orthopade 2001;30:925-31. Heyde CE, Fakler JK, Hasenboehler E, Stahel PF, John T, Robinson Y, et al. Pitfalls and complications in the treatment of cervical spine fractures in patients with ankylosing spondylitis. Patient Saf Surg 2008;2:15. Mountney J, Murphy AJ, Fowler JL. Lessons learned from cervical pseudoarthrosis in ankylosing spondylitis. Eur Spine J 2005;14:689-93. Lazennec JY, d'Astorg H, Rousseau MA. Cervical spine surgery in ankylosing spondylitis: Review and current concept. Orthop Traumatol Surg Res 2015;101:507-13. Slone RM, McEnery KW, Bridwell KH, Montgomery WJ. Fixation techniques and instrumentation used in the cervical spine. Radiol Clin North Am 1995;33:213-32. Schneider PS, Bouchard J, Moghadam K, Swamy G. Acute cervical fractures in ankylosing spondylitis: An opportunity to correct preexisting deformity. Spine (Phila Pa 1976) 2010;35:E248-52. Werner BC, Samartzis D, Shen FH. Spinal fractures in patients with ankylosing spondylitis: Etiology, diagnosis, and management. J Am Acad Orthop Surg 2016;24:241-9. Verlaan JJ, Diekerhof CH, Buskens E, van der Tweel I, Verbout AJ, Dhert WJ, et al. Surgical treatment of traumatic fractures of the thoracic and lumbar spine: A systematic review of the literature on techniques, complications, and outcome. Spine (Phila Pa 1976) 2004;29:803-14. Liu X, Bai RX, Li DD, Zhu B, Wu J. Analysis of the thoracolumbar fracture with ankylosing spondylitis. Zhongguo Gu Shang 2009;22:488-90. Sapkas G, Kateros K, Papadakis SA, Galanakos S, Brilakis E, Machairas G, et al. Surgical outcome after spinal fractures in patients with ankylosing spondylitis. BMC Musculoskelet Disord 2009;10:96. Lu ML, Tsai TT, Lai PL, Fu TS, Niu CC, Chen LH, et al. A retrospective study of treating thoracolumbar spine fractures in ankylosing spondylitis. Eur J Orthop Surg Traumatol 2014;24 Suppl 1:S117-23. Yeoh D, Moffatt T, Karmani S. Good outcomes of percutaneous fixation of spinal fractures in ankylosing spinal disorders. Injury 2014;45:1534-8. Amamilo SC. Fractures of the cervical spine in patients with ankylosing spondylitis. Orthop Rev 1989;18:339-44. Young JS, Cheshire JE, Pierce JA, Vivian JM. Cervical ankylosis with acute spinal cord injury. Paraplegia 1977;15:133-46. Zeng QY, Chen R, Darmawan J, Xiao ZY, Chen SB, Wigley R, et al. Rheumatic diseases in china. Arthritis Res Ther 2008;10:R17. Anwar F, Al-Khayer A, Joseph G, Fraser MH, Jigajinni MV, Allan DB, et al. Delayed presentation and diagnosis of cervical spine injuries in long-standing ankylosing spondylitis. Eur Spine J 2011;20:403-7. Zdichavsky M, Blauth M, Knop C, Lange U, Krettek C, Bastian L, et al. Ankylosing spondylitis. Therapy and complications of 34 spine fractures. Chirurg 2005;76:967-75. 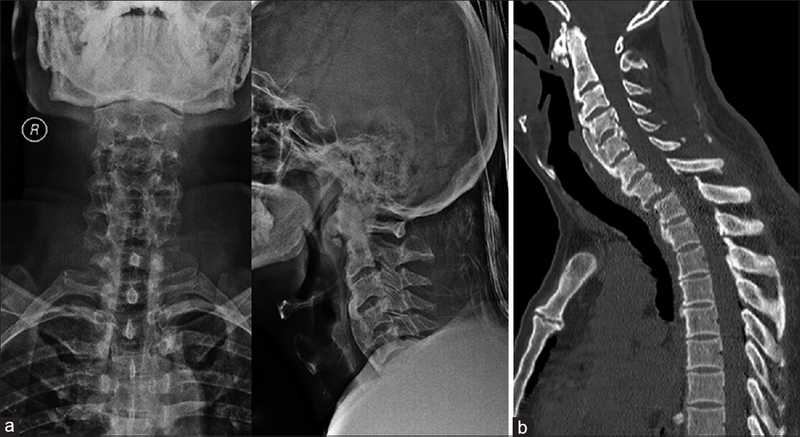 Robinson Y, Robinson AL, Olerud C. Complications and survival after long posterior instrumentation of cervical and cervicothoracic fractures related to ankylosing spondylitis or diffuse idiopathic skeletal hyperostosis. Spine (Phila Pa 1976) 2015;40:E227-33.